The year for football fans and players had disappointment, comedy, and tragedy all rearing their heads. The defining football story of the year was Leicester City’s dream run in the Premier League. Before the 2015-16 EPL season, there were reports of some bookmakers marking Leicester City at odds of 5000-1 to win the title. The club took the form book and tossed it out the window, in the process scripting a stunning tale of success in the face of history and heavyweights with several times larger bank balances and star-studded lineups. Ronaldo helped Real Madrid 11th European Cup win and the team’s second in three seasons. Just six weeks after winning the Champions League, Portugal beat France in the final of the 2016 European Championship. He won the Champions League with Real Madrid, won a major title with Portugal’s national team for the first time, won the Ballon d’Or, and to sum up the year final trophy of Club World Cup. 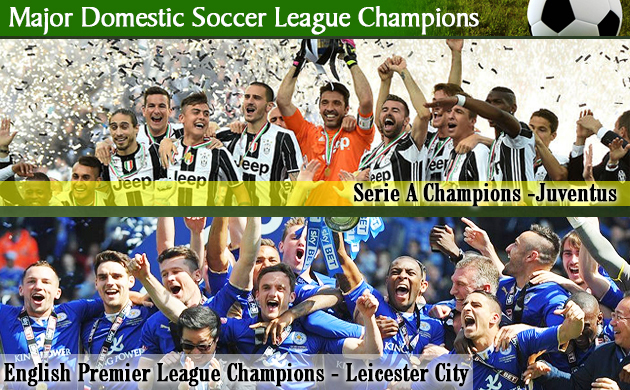 Juventus clinched the 2015-16 Serie A title following Napoli’s 1-0 loss against AS Roma, winning their fifth consecutive Italian title. The Old Lady overcame early-season adversity and the departures of several key figures to put together one of the best runs in club history, locking up the title with weeks to spare. 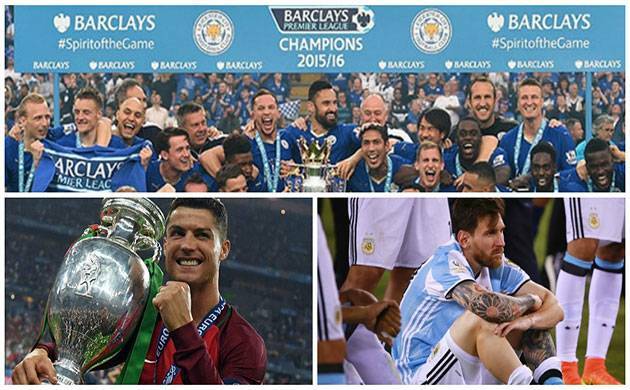 The biggest story of the football year had to be Leicester City’s shock triumph in the Premier League. The 5000-1 outsiders upsetting the existing order to not just win the title, but win it by a massive 10-point gap, thumbing their noses at the elite of the English game as they went. 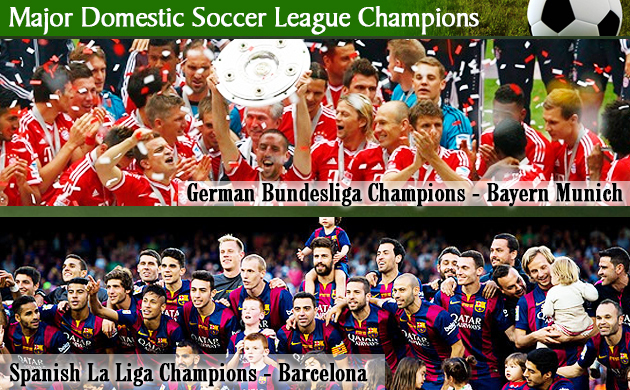 FC Bayern Munchen were at it again in 2016, as Pep Guardiola’s men steamrollered all opposition in the Bundesliga to wrap up a record fourth-straight title by 10 points over second-placed Dortmund and an incredible 28 points over third-placed Leverkusen. Barcelona claimed its 24th La Liga title thanks to a 3-0 win over Granada at Los Carmenes. The Catalans have won six of the last eight leagues, with Real Madrid in 2011-12 and Atletico Madrid in 2013-14 being the only teams to break their vice-like grip on the trophy. Paris Saint-Germain secured their third Ligue 1 title in as many years with a 2-1 win over Montpellier at the Stade de la Mosson. 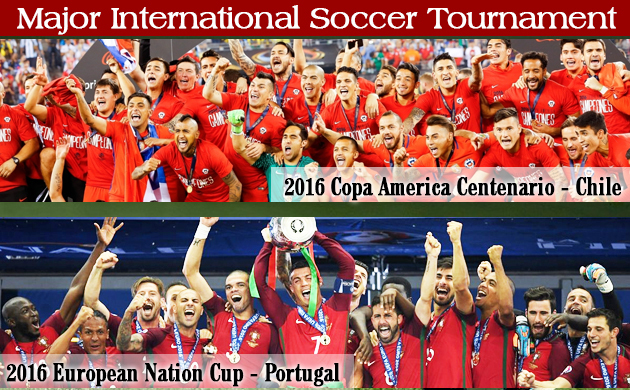 The match was contested by Argentina and Chile, making it a rematch of the 2015 final. Chile ultimately won on penalty kicks 4–2 after a 0–0 draw. Seemingly weighed down by the pressure, Messi failed to make his mark over 120 minutes in the final against Chile. But the worst was still to come: he subsequently missed from the spot in a gut-wrenching penalty shoot-out loss. The substitute Éder won the European Championship for Portugal with a brilliant goal after Cristiano Ronaldo went off injured in the first half. Portugal, the team that finished third in their group, had found a way even on a night when their greatest footballer was taken off on a stretcher. In the end, Cristiano Ronaldo had his hands on the trophy even if it was not the way the ultimate showman had intended. Neymar scored the winning penalty as hosts Brazil beat Germany 5-4 on penalties in Rio to win their first men’s Olympic football gold medal. The game finished 1-1 after extra time, with Neymar’s first-half free-kick cancelled out by Max Meyer’s strike. Neither side could find a winner before the drama of the penalty shootout gave Brazil the gold. 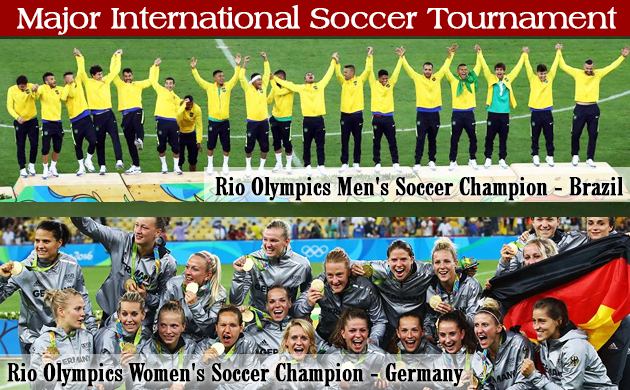 Germany won women’s Olympic football gold for the first time with a 2-1 victory over Sweden in the final in Rio. Dzsenifer Marozsan put Germany ahead at the Maracana with a curling finish, and Sweden’s Linda Sembrant gifted them a second by scoring an own goal after Marozsan’s free-kick hit a post.